The HTC Vive Pro includes a number of different design improvements that potentially make it a worthwhile upgrade for current HTC Vive owners. It's more comfortable, easier to use, features stunning visuals and much better sound, but it also comes with a hefty price tag. The HTC Vive is considered by many to be the leading virtual reality device on the market. And from 5 April 2018 things get even more exciting, as there's a new and more advanced option available: the HTC Vive Pro. As the Pro namesake suggests, the updated headset takes the already solid foundations of the original Vive and bolts on various enhancements to the design to improve every facet of the gaming experience. It's higher resolution, offers spatial audio support, plus an adjustable comfort dial for a better fit. Oh, and it's far pricier too. HTC Vive vs Vive Pro: What's the difference? All the improvements offered in the HTC Vive Pro come in the headset itself, which is why it's being sold separately and doesn't come with the base stations and controllers that you'll need to play games. Therefore this new VR device is more likely an upgrade option for current HTC Vive owners rather than a purchase for someone looking to get started with VR gaming. 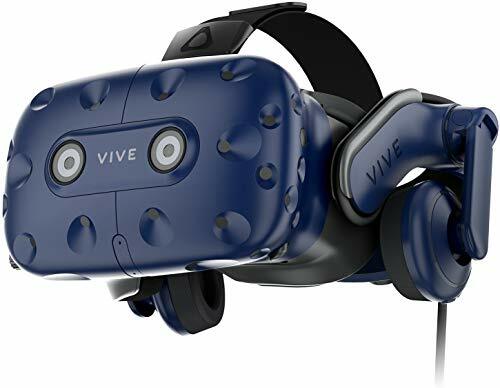 That said, there are plenty of changes that make the Pro enticing: the original Vive has one front-facing camera, the Pro has two; the same applies to the microphones; the headphones have been upgraded, too. But it's a resolution bump that is the Pro's main area of appeal. The new headset delivers a 2800 x 1600 OLED display (615ppi) with a 90Hz refresh rate. That's 1400 x 1600 per eye, quite an improvement over the 1080 x 1200 resolution of the original Vive. The only other thing we'd like to see is a faster refresh rate. Although this new resolution isn't Ultra-HD 4K, but it's still quite an improvement. We fired up a number of games we've already become well acquainted with - including The Invisible Hours, Shooty Fruity, The Lab, Superhot VR and Arizona Sunshine - and each of these games appears undeniably crisper and more visually pleasing. With enough power under the hood, you can turn the graphics settings up on these games and unleash their full potential. But even on default settings, it's instantly clear what a difference those extra pixels make. So long as you have the PC processing and graphics power to deliver. One problem with VR is you have to have your face firmly squashed up against the screen. Our mother would have warned against this for fear of our eyes turning square, but in reality the real problem is you can see each and every pixel. On the original Vive, this could be irksome at times, but with the HTC Vive Pro the resolution window issue is far less prominent. Every detail is breath-taking, text is easier to read, textures are smoother, and everything just pops that bit more. In short: with the Vive Pro it we found ourselves relieving the initial awe we'd experienced when we'd first strapped on a Vive headset all those months ago. Alongside the visual fidelity boost, the Pro also features audio enhancements, including a set of Hi-Res certified headphones built right into the headset itself. HTC has taken the improvements it made to the original Vive with the Deluxe Audio Strap, enhanced this further, then incorporated it into the Pro headset. These headphones feature an on-ear design, with small but comfortable earcups that easily pivot and click into place. It's the audio quality that really shines. These new headphones not only offer Hi-Res audio, but also spatial sound improvements - something that was sorely lacking in the original Vive. This means that in games you can more accurately hear where sounds are meant to be coming from, whether this is someone talking to you or a zombie trying to sneak up on you from the shadows. The difference such a small change makes is undeniably worthwhile. Suddenly we're more effective at downing hordes of undead in Arizona Sunshine or hearing the happenings within the walls of The Invisible Hours. We were surprised how loud and capable these small headphones are. The only downside is how ignorant it makes you of the real-world, which can be dangerous if your other half thinks you're ignoring them rather than just fully enjoying yourself. Where the original HTC Vive uses a series of Velcro straps to fit to your head, the HTC Vive Pro has a plastic head strap with a simple wheel for easy adjustment and fitting. This not only makes it much easier to slip it on and off, it also makes it much more comfortable than the original. The new design includes an improved center of gravity positioning, increased weight support, and an enhanced "face gasket" surface. What this means is you can game for longer without the misery of face-ache. The redesign includes a new face cushion and nose pad that block our more light from your natural surroundings - although even when the headset is screwed on fully, there's still some unavoidable light-bleed from the real world, but it's not enough to ruin your gaming experience. As a glasses wearer, we found the HTC Vive Pro has the same issues as the original headset: it's not terribly comfortable with the arms of your goggles pressed against your temples, plus the lenses can steam up. This can be resolved though: you can upgrade your headset with prescription lenses (and if you've already done this for the original Vive, then those lenses will fit the Vive Pro too). Another design highlight is the change in connection: the Vive Pro has a single cable coming out of it that attaches to the new and improved link box (which then connects to your gaming PC). This cable includes the audio, visual and USB connections all in one, which means there are far fewer cables to flap about around your head as you game. There's no need for a 3.5mm headphone jack or inputs, so everything is neater and easier to use. This, again, improves the comfort of the VR experience - although we're still desperately waiting for a truly wireless upgrade. The minimum system requirements for the HTC Vive Pro are barely changed from the original Vive headset. However, with an improved resolution, the new headset is obviously more power hungry. We used a fairly powerful gaming machine for testing and didn't struggle, but we're pretty sure you'd need more than the minimum spec (listed above) to make this headset run smoothly. The new link box needs power, a USB 3.0 connection to your machine and a DisplayPort connection to your graphics card. The base stations, controllers and setup process are all the same as with the original HTC Vive - so for anyone experienced with this device setup is a breeze. As you may have noted in the line above, that means the Vive Pro needs a DisplayPort cable to connect to your PC, not the HDMI connection of the original Vive. We found this out the hard way when we tried to connect to the gaming laptop we usually use for VR gaming only to come completely unstuck thanks to a lack of DisplayPort output on that machine. Something to bear in mind if you're considering a purchase. Another issue we did experience during setup was the cable that attaches to the headset had come loose and disconnected - which isn't immediately obvious as it's out of sight. After removing the facemask, there's a detachable flap which hides a USB port and the port for the proprietary cable - so it's easy enough to fix if this becomes an issue. The HTC Vive Pro is undeniably the best virtual reality experience available today... if you can afford it. There are a multitude of improvements over the original headset. The Pro is more comfortable, easier to pop on and off thanks to the new adjustment wheel, and its better fit makes for greater immersion thanks to the way it fits on the face. The enhanced graphics are clearly the main appeal, making those virtual experiences crisper, cleaner and all the more awe-inspiring. The sound enhancements make a big difference, too, largely because of spatial sound support for a far more convincing sense of surround sound. All that said, the price will put many off. The HTC Vive Pro is currently priced a penny shy of £800/$800 for just the headset itself. Yep, newcomers will need to also buy the base stations and controllers. That's roughly an extra £495/$530 on top. Which actually means it would cost you less to buy the original HTC Vive system (currently £499/$499) and the HTC Vive Pro together... bonkers, eh? HTC does offer a workaround: the Vive Pro Starter Kit bundle for £1048/$1099. So while the Vive Pro certainly sees HTC retain the VR crown, you'll need to be almost rich as royalty rich to afford one. Although not as all-signing, all-dancing as the HTC Vive Pro, the original headset has now seen a price drop which makes it more appealing and accessible. You can upgrade that with the Deluxe Audio Strap and you've nearly got the same experience, at least from a comfort point of view. If price is the main consideration, then the Oculus Rift should also be considered high up your list. Recent price drops mean this VR headset is now £399 and a far cheaper option for enthusiasts.